This switch controls multiple PCs from a keyboard, a mouse and a VGA monitor. This KVM switch is loaded with features such as hot-key, front panel push button and auto scan control. It has a complete keyboard and mouse emulation for simultaneous PCs boot-up process. 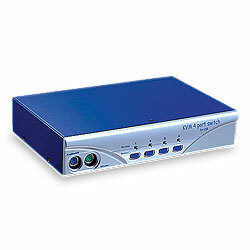 4-port KVM switch is a portable and compact size design. Hot plug - add or remove connected PCs for maintenance without power down the KVM switch or PCs.